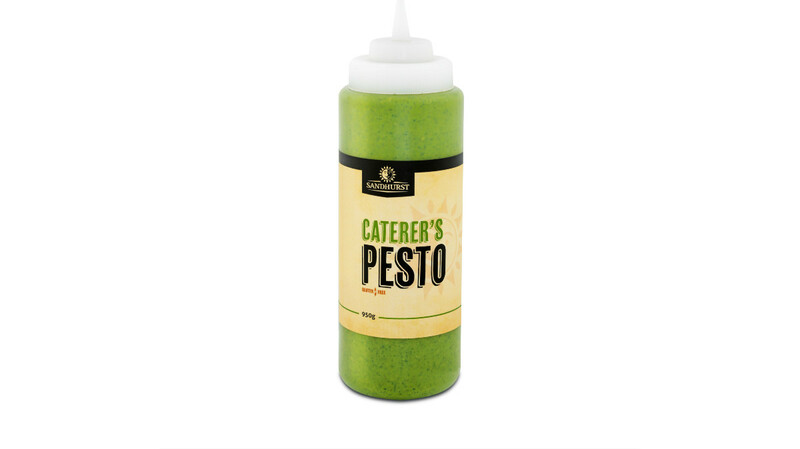 Please meet the newest addition to the Sandhurst family- our Caterer’s Pesto available in a handy 950g squeezable bottle. Great customer feedback made us realise that having a one-handed squeezable bottle for pesto would save time, money & hassle in a busy kitchen. We have adapted our original recipe that Vince developed back in 2002 to ensure a smooth outflow, but it is still made with fresh Australian basil grown by the Torrisi family in far North Queensland. The bottle allows better portion control and the dosing head allows you to use the pesto easily for garnishes, decorating and feathering- you still get the taste of genuine basil pesto made to our family recipe. Ask your Sandhurst rep for some samples of this new product – save time, mess & hassle in the kitchen! Sandhurst original basil pesto is still available in 2kg plastic pails and plastic jars. The Head Chef from Renmark Resort, Kathy Marschall, has now developed a delicious recipe using our Pesto.